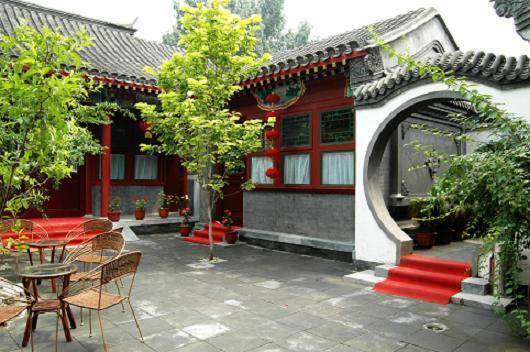 Spring Garden Courtyard Hotel, a hotel in a Chinese traditional, deluxe courtyard, where the high officials of the Ming and Qing dynasties lived. 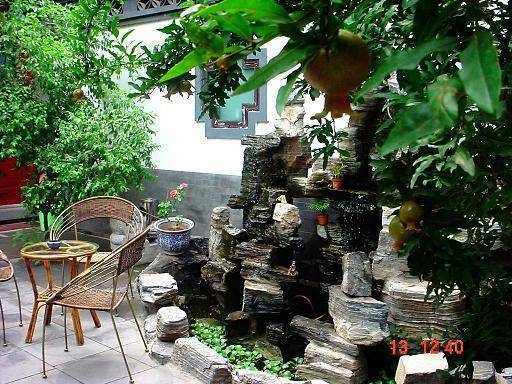 The construction of the garden began in the mid-Yuan dynasty, about 800 years ago. The hotel located at XiCheng District , Beijing . There are many landscape near here , for example, Forbidden City, JingShan, BeiHai, Houhai Bar . The hotel offers deluxe rooms which are well decorated . You can enjoy the beauty of Chinese culture and arts in here. In addition to the clean, comfortable and convenient facilities, Spring Garden Hotel offers a unique cultural connotation. 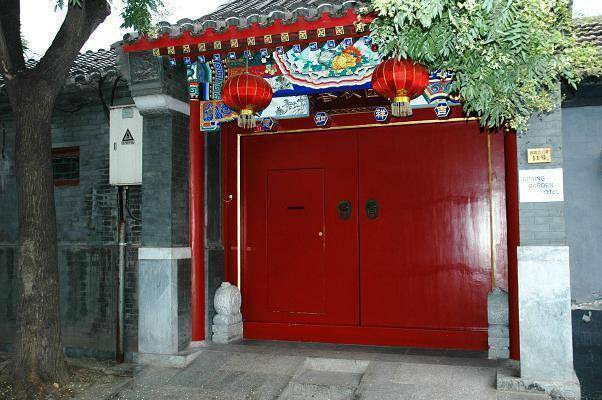 Each of the rooms introduces you, the honoured guests, to the life of different distinguished emperors in Chinese history and the dynasties that they lived in. Therefore, a visit here is an experience of the atmosphere in which the royal members once enjoyed. We promise that the guests can appreciate to their hearts content the exquisiteness of the Chinese traditional culture while enjoying the living atmosphere of Chinese traditional royal court. The decorations in all the rooms feature the classic court style. 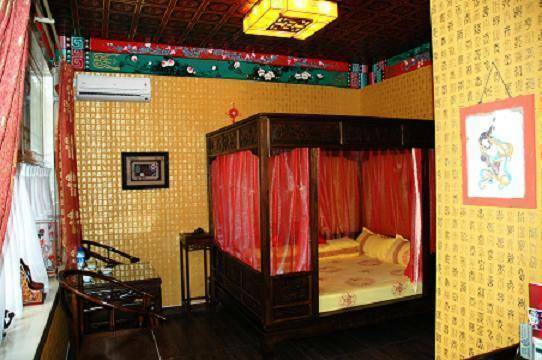 All the rooms are decked by the gold ornaments and the traditional color paintings of the renowned royal painter. 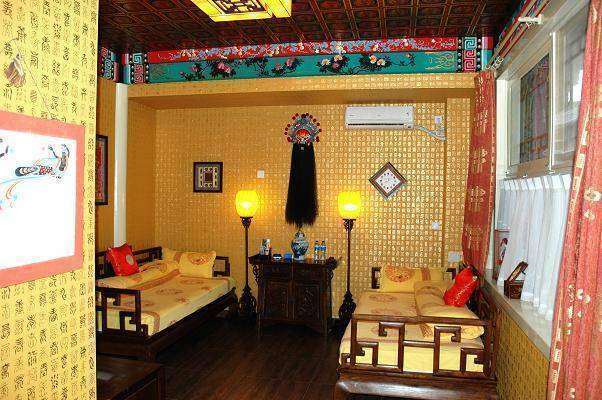 The rooms are furnished by the hardwood carved furniture of the style of Ming Dynasty. They are decorated with handmade coloured paintings, which are matched with golden decorations. You can enjoy the beauty of Chinese culture and arts in here. In addition to the clean, comfortable and convenient facilities, Spring Garden Hotel offers a unique cultural connotation. Each of the 8 rooms introduces you, the honoured guests, to the life of different distinguished emperors in Chinese history and the dynasties that they lived in. 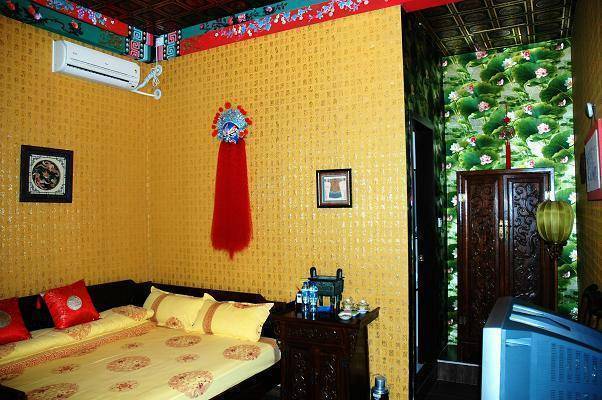 Visit all 8 rooms and you will have travelled through 5, 000 years of Chinese history and culture. Modern bath facilities, television, telephone service and climate control are available within each room. Payment to hotel on the check-in date.